I'm really struggling to get this in on time so I'm just gona post what I have so I can get some feedback before the end of the day. 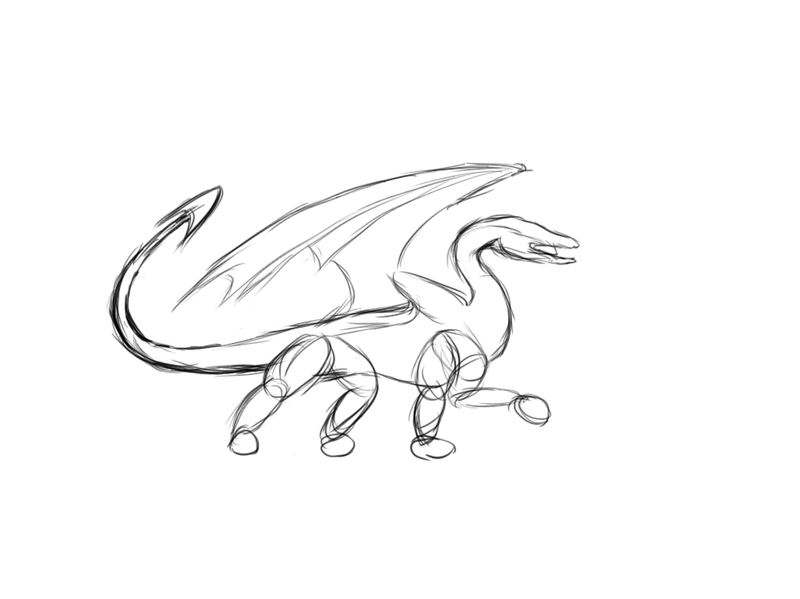 I'm trying to sketch a dragon with a borrowed Wacom tablet in Photoshop and I'm starting to animate in spriter asap. I've stopped sketching in the hope that I can get some animations out soon with art place holders (I was taking too much time learning to sketch again :/). First things I noticed are that the root bone starts at the base of the tail, it might be handy to put that sucker closer on the hips. 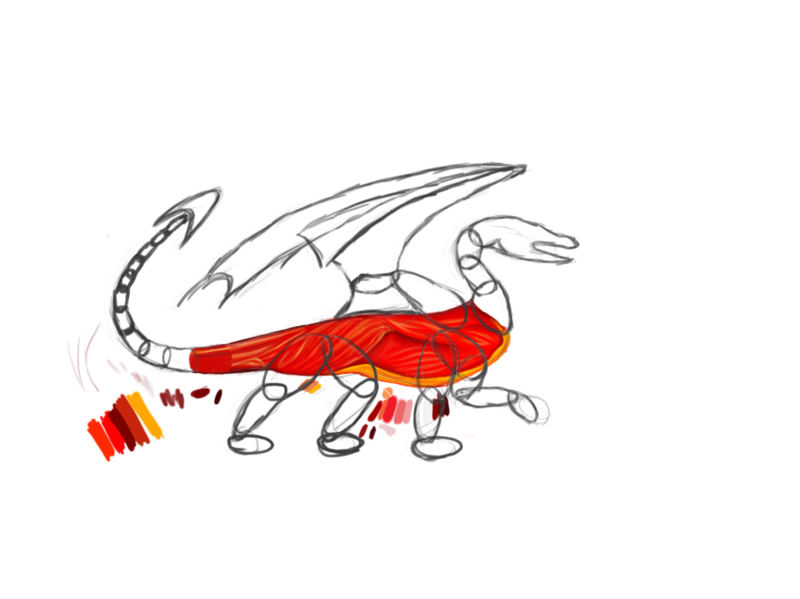 The other thing was the bone structure of the legs see attached some bones I'd put in to make for more dragon like legs. The current bone structure resembles more human like limbs. Keep on keepin' on! also ++ on muscle drawing man!! Excellent I'll try that out when I get home. Thanks dude I really didn't know what to do with the legs. um, what you might find is that because you using spriter ( which I'm assuming is just simple rigid skinning to bones ) is that you'll get a funky seem happening between joints, because of the character of texture you dealing with. 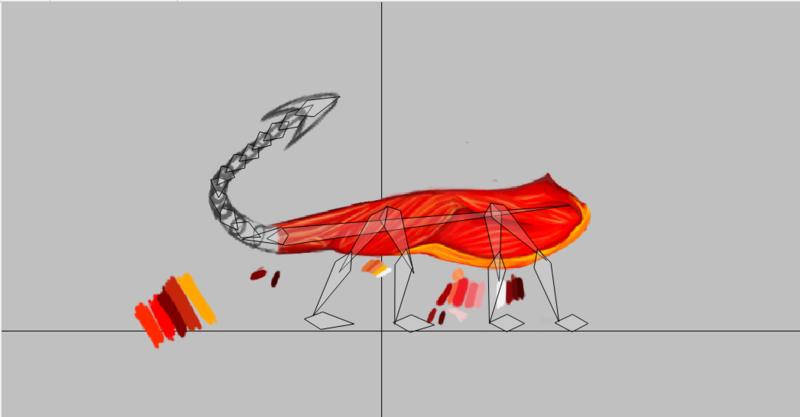 You can get past that by making the areas around the joints more of a solid color, this is the technique they'd use in cutout animation, also a reason why cutout has the simple color setups, leaving texture to happen on things that don't have joints. ( this is again on the assumption that spriter is basically parenting each body piece to the corresponding bone. Been playing Super Meat boy and it's pretty awesome indeed. Bevis and I think your silhouette could use some extra muscles, to make the Dragon look more beefy.